Fast becoming the top venue in the Inland Empire, Marinaj Banquets and Events serves LA glamour for hosts on a budget - who don’t want to sacrifice on trend-setting events. Our newest and existing venues are the perfect fit for celebrations of every kind - from Weddings to Birthdays, Corporate events, to ceremonies, private parties and more. Our exceptional service, outstanding guest experience, and beautiful reception halls are the best backdrop to any event. Guests will enjoy Host's choice of delicious Italian, Mexican or American cuisine mindfully curated by a classically trained chef for the day of your event. - ITALIAN - Guests will begin with your choice of garden salad or Caesar salad and garlic bread. MOSTACCIOLLI Penne pasta with marinara or Bolognese (meat) sauce. FETTUCINE ALFREDO WITH CHICKEN Fettuccine pasta sm othered in Alfredo sauce with grilled chicken. LASAGNA Layers of pasta with ricotta cheese, mozzarella cheese and Bolognese (meat) sauce. Vegetarian option is also available. CHICKEN PARMESAN Tender breaded chic ken topped with marinara sauce and mozzarella cheese. EGGPLANT PARMESAN Breaded eggplant ste aks topped with marinara sauce and mozzarella cheese. RAVIOLI Choice of meat or cheese stuffed raviolis topped with marinara sauce. MANICOTTI Ricotta stuffed manicotti noodles layered with Bolognese (meat) sauce and mozzarella cheese. CHICKEN CORDON BLEU Tender breaded chicken breast stuffed with ham and cheese. - MEXICAN - Guests will begin with chips and salsa. Each dish is served with Spanish rice and choice of refried, black, or pinto beans. CHICKEN FAJITAS Seasoned chicken served with grilled onions and bell peppers and corn tortillas. STEAK OR SHRIMP FAJITAS Choose from seasoned steak or shrimp with grilled onions and bell peppers and corn tortillas. BARBACOA Slow-cooked, juicy, pulled beef. MOLE Tender chicken smothered in authentic red mole sauce. BIRRIA Spicy beef stew in red chili sauce with onions, cilantro and lime. - AMERICAN - Guests will begin with Host's choice of green salad or Caesar salad and dinner roll. Each dish is served with your choice of rice or mashed potatoes and roasted vegetables. ROASTED CHICKEN With white wine burre blanc. BAKED SALMON With picatta caper sauce. TILAPIA With citrus burre blanc. PORK OR BEEF BARBEQUE RIBS With tangy barbeque sauce. FRIED CHICKEN Golden, crisp, fried chicken quarters. 6-HOUR BRAISED BEEF SHORT RIBS Tender slow-cooked braised beef with Cabernet Sauvignon sauce. HERB-RUBBED ROASTED CHICKEN BREAST Seasoned chicken breast with champagne cream sauce. - CHILDREN'S DINNER MENU - We have delicious options that are sure to please the youngest guests you host. PEPPERONI OR CHEESE PIZZA Traditional Italian pizza pie. CHICKEN TENDERS With fries, ranch and ketchup. QUESADILLA With chips and salsa. The Gold Package Includes: Principal, cake, sign-in and gift tables Custom ceiling with lights Head table décor Professional D.J./M.C. with integrated audio & synchronized lighting Linens Premium chairs Linen napkins Dinnerware-chargers, dinner plates, salad plates, flatware and dinner glass Cocktail lounge * Bartender with luxury built in bar 50% off any custom cake/cupcakes or candy table from Kito’s Cakes (Cake cutting included with Kito’s Cakes – up to $600 value) Buffet dinner with servers Complimentary beverage selection Final cleaning Security guards Photography & Videography – Essential Package Picture Easel Custom cake/cupcakes by Kitos Cakes Cake cutting, dessert plates & forks Money box Please contact us for complete information on our Gold Package. All packages include 7 hours of event time: 5:00 pm – 12:00 am. | Additional time subject to hourly fee. Liability insurance is not included. Please contact us for our complete terms and conditions. The Platinum Package Includes: Principal, cake, sign-in and gift tables Custom ceiling with lights Head table décor Professional D.J./M.C. with integrated audio & synchronized lighting Linens Premium chairs Linen napkins Dinnerware-chargers, dinner plates, salad plates, flatware and dinner glass Cocktail lounge * Bartender with luxury built in bar 50% off any custom cake/cupcakes or candy table from Kito’s Cakes (Cake cutting included with Kito’s Cakes – up to $600 value) Buffet dinner with servers Complimentary beverage selection Final cleaning Security guards Photography & Videography – Essential Package Picture Easel Custom cake/cupcakes by Kitos Cakes Cake cutting, dessert plates & forks Money box Plated Dinner service Video/Slideshow Projection Limousine (4 hours) Photography & Videography – Premium Package Candy Bar Buffet Invitations, RSVP & foil lined envelope by Bella Impressions Evening Coordinator (4 hours) Please contact us for complete information on our Platinum Package. The Silver Package Includes: Principal, cake, sign-in and gift tables Custom ceiling with lights Head table décor Professional D.J./M.C. with integrated audio & synchronized lighting Linens Premium chairs Linen napkins Dinnerware-chargers, dinner plates, salad plates, flatware and dinner glass Cocktail lounge * Bartender with luxury built in bar 50% off any custom cake/cupcakes or candy table from Kito’s Cakes (Cake cutting included with Kito’s Cakes – up to $600 value) Buffet dinner with servers Complimentary beverage selection Final cleaning Security guards Please contact us for complete information on our Silver Package. Fittingly named after the Extraordinary 11-foot-wide Austrian Crystal Chandelier crafted in Italy – this room rises to your occasion with glamour and awe. The impressionable 20-foot tall ceiling and grand wrought iron entry doors make your entrance one they will never forget. 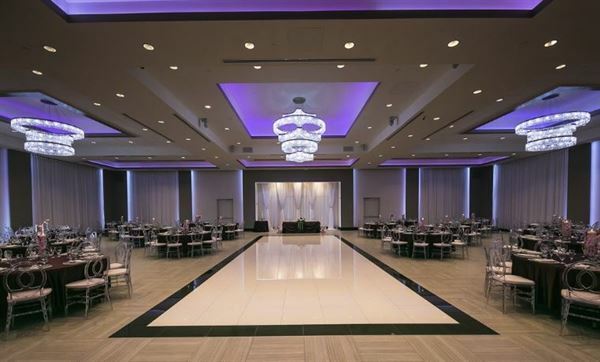 Take a step into timeless elegance in the Grand Ballroom. Two striking Austrian Crystal Chandeliers and transform your event into a venue fit for royalty. Chiffon drapes enhance the ethereal presence the ballroom exudes and custom lighting transcends your event. Full-service lighted bar, state-of-the-art audio and custom LED lighting will set your day apart from the rest. Be transformed into elegance by stepping foot inside the Princess Ballroom. Custom draping and Crystal Chandelier make this ballroom a timeless backdrop for the event you desire. Perfect for guests up to 150, and has a private kitchen for top-notch, convenient service for you and your invitees. A Ballroom fit for those with an eye for luxury and exquisite details, the Royal Ballroom boasts three Austrian Crystal Chandeliers so that every inch of the room experiences the sophistication. This modern and timeless design will impress your guests with a designated porte de cocher, multi-level ceilings, custom lighting and optional private outdoor lounge. Marinaj Banquets first ever outdoor venue! A perfect location for outdoor ceremonies, bridal showers, baby showers, cocktail parties, birthday parties, and more!